To restore Backups, first login to your cPanel. After logging in, you should go to the Backups interface located under the FILES banner. Here you will be taken to the same page you would have gone to to create a backup for your site. 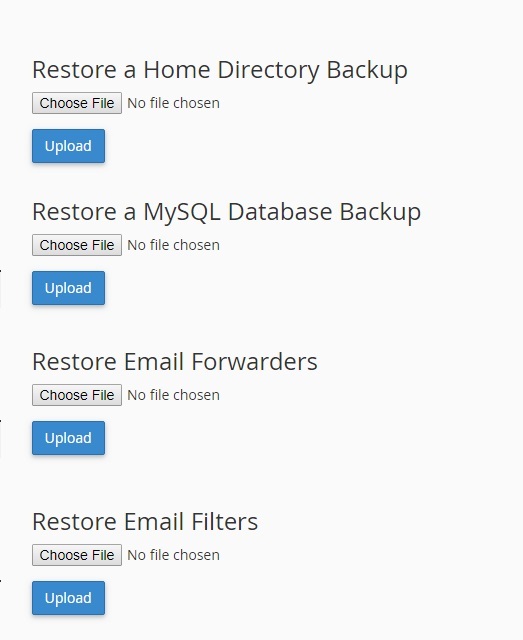 After entering this page, scroll down until you see various Restore options for your site. Simply click the Choose File button, and you should then be able to choose which backup you would like to restore, depending on if you have multiple backups. Once you have chosen your backup, you will then click the blue Upload button, and afterwards, you will then see the progress of your files being restored.